Owning a home aquarium or pond can be a very rewarding experience. 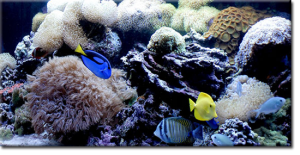 It is a fun and rewarding learning process, and the joys of maintaining the home aquarium will reward you everyday. That said, there are lots of questions that a new aquarium owner may have. We want you to be able to ask us anything, and we will answer any questions you may have about being a home aquarium owner. Just leave a comment on our blog, twitter or Facebook, and each week we will answer your questions. Q: I have an algae problem in my tank. Even though I clean the tank, after a little while algae seems to be growing on everything. What am I doing wrong! A: This problem comes in a tank that is planted, and exposed to lots of light. First of all algae loves light, so you may be leaving the lights on in your tank for too long each day. Try leaving the lights on for only 6-8 hours each day. Also try injecting the water with a CO2 booster every other day to combat the algae problem. You can also try putting some trapdoor snails in your tank that will consume the algae growing on the plant surfaces. Keep sending us your questions and let us know how it’s going with your home aquarium. Also feel free to call or email us anytime.